Grocery prices are going up everywhere.The other day, I took my husband grocery shopping with me and I sighed when I looked at all the prices. You get the idea.It actually was quite disparaging to me, because it means our grocery budget is stretched out to the max these days. And, it may be that way for many of you as well. 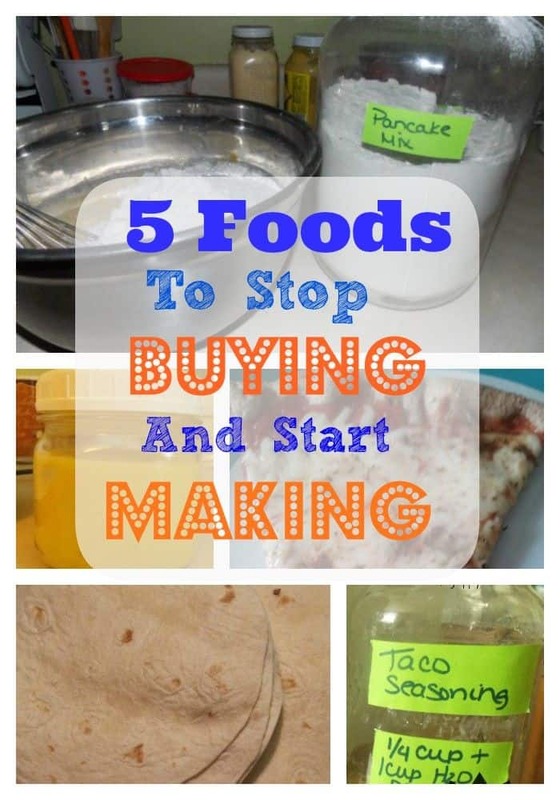 I want to show you how we save money starting with making these 5 foods to stop buying and start making at home. Simple, easy and far more nutritious for you, too! A frozen pizza will cost you about $4.00 and take out pizza can cost up to $10 for a medium. With hungry teenagers who practice TaeKwonDo 3 hours a day, we need about 4 pizzas for my family. And $16-$40 for one meal just isn’t in my budget. Not to mention the questionable ingredients! So, I learned to make my own! Begin by sprinkling the yeast over the warm water. Add the sugar and oil, and stir to combine. Let sit for 5 minutes to “proof”, then add the flour in 1 cup increments. Mix on medium speed with dough hook (or get some really good arm exercise and knead by hand) for about 1 minute, then add the garlic powder and salt. Mix together well for 5 minutes to allow gluten in flour to develop. Allow to rise for 5-10 minutes, while oven is preheating to 450° degrees. Roll out the dough onto a cookie sheet, pizza pan or baking stone. Pierce with a fork all over, also called “docking the crust”. Bake the crust for 7 minutes alone. 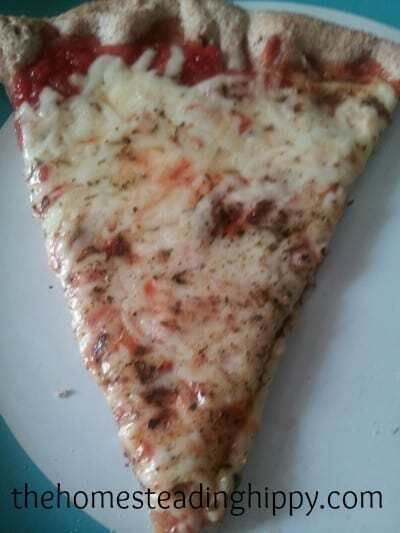 Remove from oven, and top with sauce, cheese, and toppings. Return to oven and bake for an additional 20 minutes, or until cheese is nicely browned and bubbly. Allow the pizza to cool for 5 minutes before you cut it. This will help the cheese to stay in place, especially if you are like my family and pile that cheese on high. You’d be amazed at how long I bought into the notion that I *needed* to actually buy the dry boxed pancake mix! I’m almost embarrassed at the fact that it took me YEARS to figure out that all I really needed was flour, salt, sugar, baking soda, and baking powder! Add to that some milk, melted butter and eggs…and voila-pancakes! Mix the above ingredients and store in a tightly closed container. I put mine in a gallon sized glass jar on my pantry shelves. Use within 6 weeks. To make pancakes, simply take 2 cups of the mix, add 4 tablespoons melted butter, 2 eggs and 2 cups of milk. Mix gently and use 1/4 cup of mix per pancake. Wait until the pancakes are all bubbly and dry on the top side before flipping over. You only want to flip them one time, otherwise you may end up with tough pancakes. 1/2 TEASPOON cayenne pepper (more or less, to taste for spiciness) Mix all together and store in a covered jar or container for up to 6 months. To use, simply add 1/4 cup of mix and 1/2 cup of water for each pound of browned meat. This is also great sprinkled on roasted potatoes or on chicken. We can easily go through about 50 tortillas a week, especially if my daughter makes lunch. Her favorites to make are quesadillas and tacos. Of course, they are really only flour, salt, fat and water and take about 10 minutes to make. Mix together the salt and flour and cut fat into it until it’s about the size of peas. Add water, 1/4 cup at a time until dough comes together. Knead together for about 2 minutes until smooth. Allow the dough to rest, under a damp cloth for about 5-7 minutes. Divide the dough into 12 little balls. Roll out with rolling pin and place on a dry skillet. Cook for about 1 minute on each side. Remove to a plate with a towel covering to help hold in heat. If you happen to have any left over, heat up some coconut oil, or tallow the next day to 350°. Cut the tortillas into triangles with a pizza cutter and fry up. Season with salt, pepper, and garlic powder for some delicious chips for snacking! When I tell people that I make my own mayo, I have gotten responses from “oh, cool!” to the blank stares as if I told then I could transmute base metals into gold. It’s so simple, so easy to whip up a batch of your own mayo that you’ll wonder why you should buy the store bought stuff ever again! In a blender or food processor, add 3 egg yolks and 1 whole egg, the mustard and salt. Mix on high for a minute. While the mixer or food processor is still running, gently drizzle the olive oil in a little stream. This will begin to coagulate and thicken as you do. Store in the fridge for up to a week. You can lacto-ferment your mayo by increasing the salt to 1 Tablespoon, and stirring in 1/4 cup whey to the finished mayo. Allow to sit at room temperature for 7 hours before storing in the fridge. What foods are you making at home that you used to buy? Interesting! I might try the mayo. We go through a ton of it. Not sure if I will do the tortillas. We do use quiet a few of them, but we use like 20-30 at a time. And that’s being light. With 10 people eating, and 3 of those being guys who want like 7 tacos at a time, you can understand why. LOL Definitely doing the taco seasoning. I’ve done it before, but it’s been awhile. We need a new mix. Such a great post! I make all of these except for mayo and tortillas – we don’t eat these in our house. I would also add soups and tomato sauce to the list! Do you keep the coconut oil in a solid state, melt it, or does it not matter? depends on what I am making it with…for the tortillas, It’s easier to use in a solid state. Thank you! The tortillas I’ve made have no fat in the recipe and are tasty but not soft and flimsy like I want. I’ll have to try coconut oil! Great post!! I make all these things from scratch too. We do homemade pizza and pancakes but I’ve always wondered about taco seasoning. Thanks for sharing this! Definitely pinning to use later! 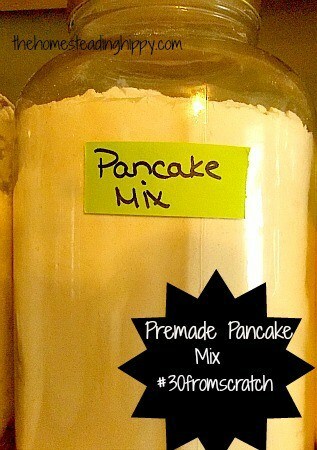 I was so happy to see the Premade Pancake Mix recipe! This is something that I really wanted to try bc we love our Pancake Sundays. I always seem to run out of batter before my monsters are done. Those tortilla’s look amazing! I never thought of making those on my own. Do you find they freeze well if you premake them? Homemade pizza is the best! I love adding Italian seasoning, cheese, onion, and sausage. SO yummy! I have already been making many of these things at home, but I had NO idea that tortillas are that simple! They are one of my son’s favorite foods and he probably has something tortilla based three times a week. Oh, the savings we could have! The only one of these I don’t do so far are the tortillas. I’d add canned beans to the list. Buy dry beans, cook, and can your own. Makes it super easy to use them and no extra salt and chemicals. I make homemade mayo all the time – the store bought now tastes so blah. I always add fresh lemon juice & dry mustard to mine and a few dashes of hot sauce just to perk it up. We make homemade pizza all the time. Never thought to make my own tortillas. Homemade is just so much better, isn’t it? The only thing I have not made is Taco Seasoning…guess I am doing pretty good! Taco seasoning, tortillas and pancake mix, these are all things I buy frequently. Wait, did you already know that?… Great post! i’ve been making my own bread and saving lots of money that way. i can make organic loaves with multiple grains mixed in for well under $1 per loaf. (was paying around $3.50 per loaf or more for organic in stores). i also recently made bagels – organic, whole wheat for around 40 cents a batch. I am definitely bookmarking this! This will save us a lot of money, especially on taco night (my favorite!). My husband was just saying yesterday that we need to go to the grocery store and pick up some pancake mix. This recipe just saved us a trip! We seldom buy canned beans. We cook them up, and put them in the freezer until needed. If there are several different kinds, a 3-bean salad is almost instant, and good for a quick pot-luck. I will try this homemade mayo. Looks simple to make. Coming from Simple Saturday Blog Hop. Come-by and visit me. Hmmm – just came across your site in search of more self-sufficiency stuff. Good idea to encourage people to make these five things – and many more. I am appreciating my mum tonight because she taught me how to cook from scratch. I have never (even before my current do-it-yourself phase) bought pancake mix and taco seasoning. We hate supermarket pizza, so if we feel rich, we take-out but most often we do our own. I have made mayo in before but find it difficult. Will try your recipe. 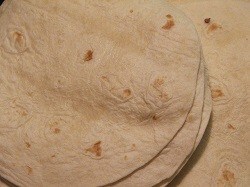 Tortillas are sooooo easy to make, why would anyone bother buying them? More please 😀 like Tomato Sauce (Ketchup), BBQ Sauce, soft cheese, yoghurt, sausages, bread, etc Thank you. they are coming up! thanks for stopping by! I add just a sprinkle of baking powder in my flour to get puffy rising tortillas (think gorditas). I only make these homemade any more… Everyone in the family LOVES them.. Even the 2 year old! We freeze them too! It’s amazing what we can make ourselves! A woman after my own heart! I love making things from scratch and saving money to use on preps!